Brown’s Road ….. now called Blackbean Rd. Where Blackbean Rd, comes out onto the main Wilsons Creek Rd., there was a well built timber mailbox. This was on the opposite side of the road. In the 1950’s and 1960’s everyone had a well built timber mailbox to receive mail and bread from the town bakery every day. If the farmer sent cream cans to the nearest Butter Factory, the mailbox was built as a sturdy cream box. A cream carrier (who was Frank Sigley from up the Creek), ran his covered cream carrier truck in and out every day for the daily mail and bread. Browns always had a sturdy mailbox built on the opposite side of the road which was the righthand side for outward bound mail carrier. 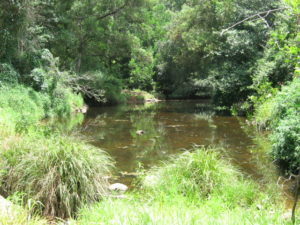 We would always walk from Wilsons Creek Primary School around the corner from Whipp’s property, down the hill and over the small creek to the left and up to the Primary School. In the afternoon we would walk as a group and do the same thing. We would collect the bread for Mr. and Mrs. Brown on the way home. Brown’s Road as we called it in the 1950’s and 1960’s was a gravel road into neighborhood properties with their respective houses: Brown, Butterini, Graham and the Knight’s property. There was even an access track that we Aitken’s could use which cut through the Knight’s property into the back of our property. It was a bit hilly at the end but it was accessible in a Land Rover. It was a communal road with open cow paddocks on either side of the road. There was an understood principle of a right of passage across anyone’s land. 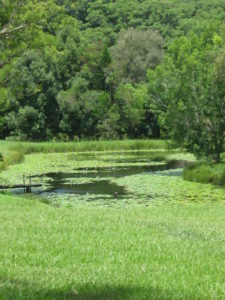 In the 1970’s and onwards the land was subdivided into smaller allotments which meant that cows didn’t keep the grass down and the open paddocks began to be planted with original rainforest species. 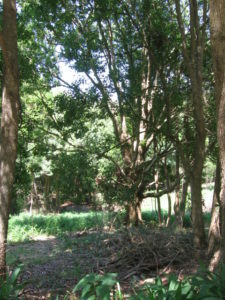 Camphor laurel trees grew in abundance in the 1990’s and 2000 and beyond which meant the original grass disappeared altogether. nest out in the paddock. I marked the spot with my eye and began steadily walking to the spot. Of course the bird became very agitated and started attacking me. Walking steadily to the spot I came a grass lined depression the ground with cluster of olive speckled 40 mm long eggs. The Crows Ash Tree and my Birds Egg Collection: in the 1950’s and 1960’s, I was still in Primary School going to Wilsons Creek. Every day we walked home from school with the three Graham boys. In the paddock opposite Brown’s mailbox there was a big Crows Ash tree. Fig birds were small birds with olive plumage and red cheeks which would build their nests right out on the ends of far out branches. They would build finely woven nests on a small forked branch with several dark olive eggs in the nest. I would use my egg stick to with its wire loop and a toe of one of Mum’s old stockings sown in the loop, to reach right to a nest and dip an egg out. I would then draw the stick in and put the egg in my mouth and climb down the tree. This photograph in January 2006 is of this particular tree is still there since 1960 when I used to climb up it and get fig birds eggs. The tree is now crowded by Camphor Laurel trees. This is my birds egg collection forty five years on from 1960. The eggs were kept in two shoe boxes with cardboard dividers and cotton wool. The first box was for small eggs and the second box was for larger eggs. Each egg has a story and represents hours of identifying the bird, the nest and collecting the egg. I would only take one egg from a nest. The pale blue egg in the second bottom row of the second box is quite significant. It is blue crane’s egg but it has a large hole in the shell. The egg fell out of a nest when Johnny Greentree and I where exploring the open paddock below Whipp’s house We were walking along the little creek that flows down to the main Wilsons Creek and we came to this big open teak tree. A blue crane flew off her nest on a high branch and this particular egg fell down ….. it had hatched already. I kept the egg as blue crane’s nests were very rare. The new owners of this allotment had dug out a large waterhole on which were growing many blue waterlilies. In the 1950’s this area was a swampy area full of bulrushes. The new owners have taken advantage of this major soak beside the creek and have dug it in a more prominent way with grassy banks. 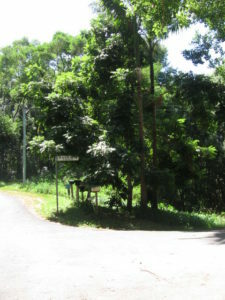 A large red apple tree (remnant rainforest tree) used to by the road going in and down towards the crossing. Yearly it would drop the small red 50 mm fruit in abundance on the grass beneath the tree. 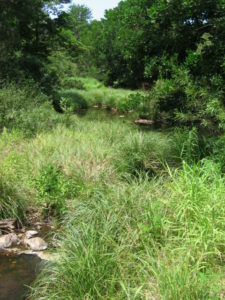 The Creek … Browns Crossing: In the mid 1900’s this creek would be turned into a tossing brown sea of water with the yearly cyclones. A wire flying fox on the topside of the crossing enabled everyone to get out to the other side when the cyclone was on. As primary school children, we would walk across the crossing as the water went down in varying depths of water. On the topside of the crossing was a fascinating phenomena …… that was the swirling water whirlpools on the topside as water funneled down into the pipes under the crossing. There was a very large Hoop Pine tree was just up the bank on the left hand side of the crossing in the open cow paddock. It had radiating branches around a 1.50 metre wide trunk and I would climb tree on the branches like a ladder to twenty metres above the ground. I understand was cut down and milled for its timber in the 1980’s. galvanised iron sheeting which was a real luxury in the 1950’s for anyone. In later years of the early 1960’s, this tin canoe was washed by a cyclone far down the creek to our top swimming pool. 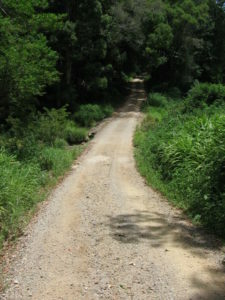 The Road In: The road in going up from the crossing with the branch that went up to Butterini’s house in the 1950’s. Now in 2006, that branch is the main road in. 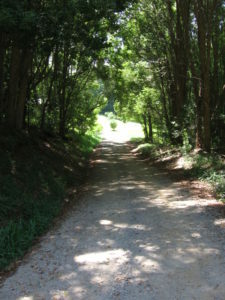 The road to Brown’s house veers to the left. The road used to be in open cow paddocks but now trees have grown up which now crowd the road in to make it very enclosed. Mr. & Mrs. Brown on the Hill: …Their house was quite a significant house set on a hill. 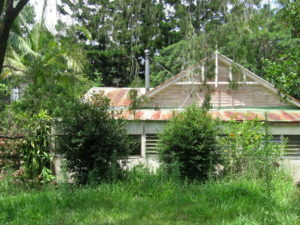 Browns had come out to Wilsons Creek in the bullock trail days of the early 1900’s to clear their land, grow bananas on the slopes and build their big house with its cream painted weatherboards, tin roof and big wide verandas. Mum had gone over to see Mrs. Brown to have a cup of tea and socialise. I was very small …. About six or seven … I was eating an Arnott’s milk biscuits and drinking a cup of milk ….. I was dipping the biscuit in the milk …. I still occasionally dunk my biscuit in my hot drink to this day. 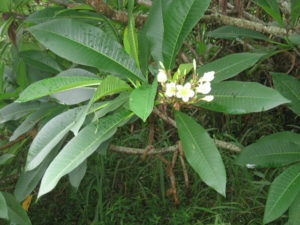 I was swinging and climbing in the frangipani trees out the back of Browns …. the few frangipani trees planted down our driveway at Chambers Flat are a reminder of these experiences. Mr. & Mrs. Brown on the Hill as we knew in the 1950’s. The new owners have built a new cream brick house on the same access road. Mr. & Mrs. Brown;s house as we knew it, is now a dilapidated unused house.